The Jazzmaster is a cool guitar but the pickups are more noisy than other Fender pickups and since the beginning guitar players have been forced to endure annoying mains hum from their Jazzmasters. That got worse when modern players began using Jazzmasters under gain. 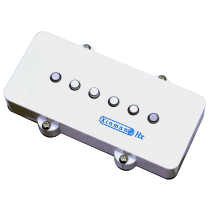 But, as with the very use of Jazzmaster, things have changed and in May 2013, after 4 years in development, Kinman has come to the rescue once again and designed a Zero-Hum (noiseless) pickup that delivers dramatically improved Jazzmaster sound. Number of parts in other brand noiseless: There are no other noiseless Jazzmaster pickups with Alnico rod magnets.